As we approach the New Year, it is time to reflect on the milestones achieved and efforts made to Unite, Promote and Develop the co-operative and mutual sector in Canada. The year started with our advocacy in full swing with the Solving Challenges Together Campaign. With Motion M-100 up for debate, multiple meetings took place on the Hill to consolidate support for the Motion from all parties. This campaign included our first targeted social media and digital advertising campaign that illustrated how co-operatives can work with the government on solutions to burning issues. Alexandra Mendès, the Liberal MP from Brossard – Saint-Lambert initiated debate on the Motion on February 13 with the CMC Board and staff watching from the gallery in the House of Commons. The Motion called on the Government of Canada to recognize and promote the co-operative sector in Canada. MPs from all parties and from all regions were happy to support co-operatives and mutuals and most had inspiring local examples to share with the House. On April 5, Motion M-100 was adopted unanimously 284-0. The government response to Motion M-100 was positive but it was clear that CMC had a lot of work to do to help define exactly how the government could capitalize on the will of the House. Winter of 2017 kicked off the Canada 150 celebrations across the country. CMC launched a campaign to collect co‑operative stories from across that, taken together, will define the movement as it is today for future generations. This project culminated with a gathering of selected co-op “Champions” at our Delegates Conference who participated in the form of a human library on November 30. Co-operative Congress was held in the Nation’s Capital in 2017 bringing members together to enjoy the capital during a year of celebration. It started with a street party on the Sparks Street Mall and co-op included activities around the region. It was a great opportunity to explore the best that the National Capital Region has to offer at a peak moment of celebration. 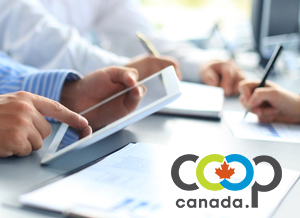 In 2017 CMC began the task of creating a National Database and Survey of all non-financial co-operatives in Canada. A task force was struck and a project team assembled to establish an up-to-date and validated directory of co-operatives and mutuals in Canada. To date we have managed to record data on more than 7,700 active co-operatives and mutuals. This project lays groundwork to position CMC as the source for co‑operative information in Canada. CMC, armed with the generous support of the Desjardins Group, supported the emerging platform co-operativism movement in Canada by sponsoring two events. On September 8-10, CMC convened the Disrupting the Disruptors Conference in Toronto, which was CMC’s first educational event, targeted at entrepreneurs, activists, academics, and co-op developers. Fall of 2017 included the long-anticipated launch of the Canadian Co-operative Investment Fund (CCIF)! With a fund manager in place and $25 million in investment committed by the co-operative sector, the CCIF will now begin accepting loan and investment applications in early 2018. The International Co-operative Alliance (ICA) held its Global Conference in Kuala Lumpur, Malaysia in November 2017. A Canadian delegation attended and celebrated the contributions of Canadian co-operators to the ICA Board. Monique F. Leroux ended her tenure after 2 years of work at the global level handing the reigns to Ariel Guarco, of Argentina. Kathy Bardswick’s participation on the ICA Board also came to an end in Kuala Lumpur. As these prominent Canadian co-operators exit the international stage, we’re happy to inform you that Alexandra Wilson, CEO of the Agency for Co‑operative Housing was elected to the ICA Board. At the end of November CMC held its 4th Delegates Conference and Parliamentary Reception. The Reception was held in Centre Block on Parliament Hill after a full day of advocacy by CMC members which included 42 meetings with Parliamentarians and their staff. The Delegates Conference followed the next morning and explored the question of the United Nations Sustainable Development Goals (SDGs) and co-operative principles through an engaging panel discussion. In the afternoon, the topic shifted to how co-operatives can become “top-of-mind” in political discourse in Canada. CMC is proud to advance the mission and values of the co-operative and mutuals movement in Canada… and we need your help. In the coming months, we will be calling on you to meet your local MP and advocate on behalf of your own co-op and co-operative enterprises from all regions of Canada. As we begin 2018, we will continue to advance toward a productive partnership with the federal government. We will also work hard to build public understanding of the co-operative model and use the lens provided by SDGs to build momentum for increasing its applications for solving our challenges together in Canada.